The Friends of Ukraine Network (FOUN) met to discuss measures that can be taken to challenge Russia's occupation and militarization of Crimea, focus attention on widespread human rights violations on the annexed peninsula and, eventually, return Crimea to Ukrainian sovereignty. The gathering, held on March 14th under Chatham House rules, was initiated by the Embassy of Ukraine in the USA and hosted by the U.S.-Ukraine Foundation. The Ukrainian perspective was presented by Ambassador Valeriy Chaly, as well as Mariya Ionova, a Member of Parliament who serves as the Deputy Chairperson of the Committee for European Integration, Cyborgs movie director Akhtem Seitablayev and former POW Volodymyr Zhemchugov. FOUN participants included Amb. Alexander Vershbow, Amb. John Herbst, Amb. Roman Popadiuk, Ian Brzezinski, Phillip Karber, Herman Pirchner, Orest Deychakiwsky, Nadia K. McConnell, Robert A. McConnell and Adrian Karmazyn. Members of the FOUN National Security Task Force met with Stepan Poltorak, Ukraine's Minister of Defense, at a February gathering hosted by Amb. Valeriy Chaly at the Embassy of Ukraine in the USA. Participants included Stephen Blank (American Foreign Policy Council), Ian Brzezinski (Atlantic Council), Michael Carpenter (Penn Biden Center for Diplomacy and Global Engagement), Gen. Wesley Clark (former Supreme Allied Commander Europe, NATO), Don Jensen (Center for European Policy Analysis), Phillip Karber (Potomac Foundation), Nadia K. McConnell (U.S.-Ukraine Foundation) and Robert A. McConnell (McConnell and Associates). Minister Poltorak thanked the representatives of FOUN for their support of Ukraine and their efforts aimed at improving Ukraine's defense capabilities. During his visit to Washington, the Ukrainian defense minister met with his American counterpart-U.S. Secretary of Defense James Mattis. In her readout from the meeting, Pentagon Chief Spokesperson Dana W. White noted: "Secretary Mattis emphasized the value of the U.S.-Ukraine security partnership. He praised Minister Poltorak for his country's sustained courage in the face of Russian aggression, and reiterated U.S. support for Ukrainian defense reform goals. He cited the Law on National Security as an urgent priority, and expressed his hope that the Presidential Administration and Ukraine's parliament, the Verkhovna Rada, take swift action and pass legislation that ensures a solid legal basis for the implementation of defense reforms in support of a secure and democratic Ukraine. The two leaders pledged to strengthen a lasting partnership between the U.S. and Ukraine built on common security interests and shared principles." 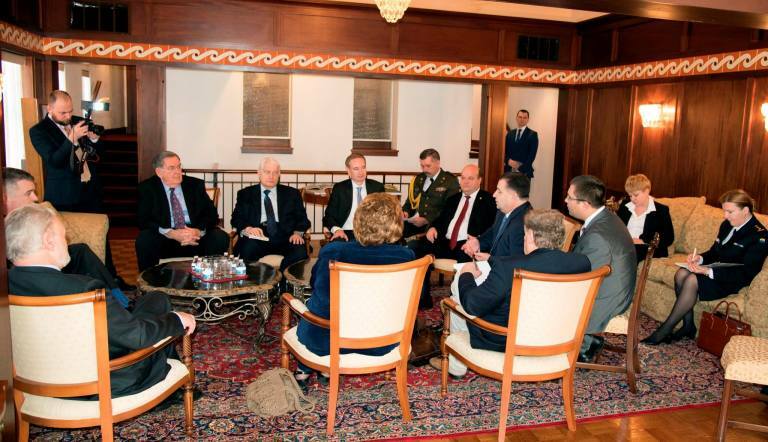 Photo at top of page: The Friends of Ukraine Network meets to discuss responses to Russia's occupation of Crimea. (Photos courtesy of the Embassy of Ukraine in the USA). Diplomatic relations between the United States and Ukraine are eminent. As former US Ambassador to Ukraine Steven Pifer writes in his new book, The Eagle and the Trident, they have almost always been good. Ukraine's outstanding sacrifice was to give up the third largest nuclear force in the world. An unfortunate consequence was that Russia started a war of aggression against Ukraine in 2014, annexing its southern peninsula of Crimea and occupying part of eastern Ukraine with irregular Russian troops. The United States responded with limited military supplies and eventually lethal weapons. Anders Åslund is a resident senior fellow in the Eurasia Center at the Atlantic Council. within the Friends of Ukraine Network, an initiative of the U.S.-Ukraine Foundation. In 1988 Ukrainians around the world commemorated the Millennium of Christianity in Ukraine. As is so often the case the Ukrainians had to fight the worldwide Kremlin propaganda machine trying to appropriate Ukraine's Millennium for Russia. Part of these commemorations included the 1000 pysanky exhibit in Congress, hosted by Senators DeConcini and Richard Lugar, and sponsored by the National Committee for the Commemoration of the Millennium of Christianity in Ukraine. Some of the best pysanky artists from across the US and Canada brought their collections: Helen Badulak, Boris Sawyn, Marta Tyshynsky, and Sofia Zielyk. Sofia Zielyk, whose pysanky often graced the windows of Tiffany, also did demonstrations of the art of creating pysanky. The well-attended exhibit was open to the public and each Senator and Representative was personally invited to visit the exhibit and select a pysanka with a special holder as a commemorative gift. The Chopivsky Family Fund contributed an icon exhibit. The pysanka was an appropriate symbol for this milestone for many reasons. First and foremost, the pysanka is one of just a few cultural icons of Ukraine that Russia has not tried to claim for itself. Even in the decades when hardly anyone acknowledged the existence of Ukraine, apart from perhaps being a region of Russia or the Soviet Union, or Ukrainians being a separate nationality, the pysanka was always identified as Ukrainian. For Ukraine the 'mighty' pysanka might be one of the greatest antidotes of all time against the Kremlin's propaganda. Archeologists have discovered ceramic pysanky in Ukraine dating back to 1300 B.C. In the folk life of Ukrainian people, the pysanka possess talismanic powers. Receipt of a pysanka is not only a token of friendship or esteem but also brings with it protection from harm. With the acceptance of Christianity in 988 A.D., the pysanka has been part of the Christian tradition and Easter ritual. The pysanka came to symbolize the rebirth of man, as represented by the Resurrection. 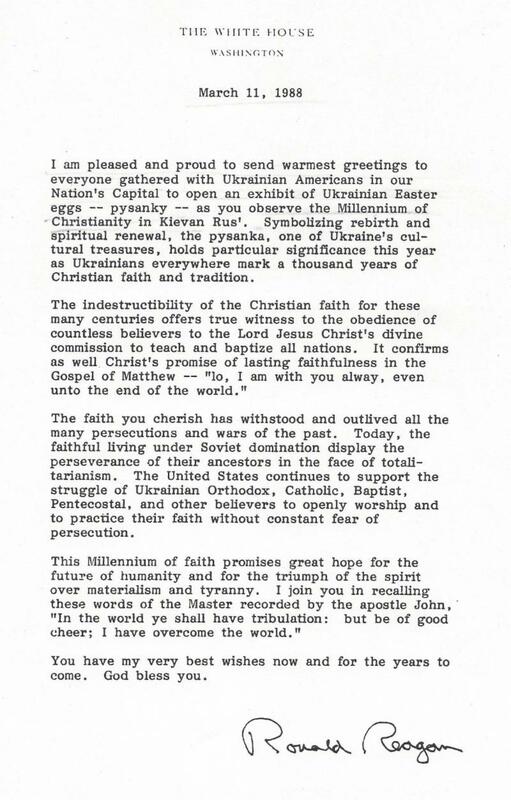 President Reagan sent the following greeting on the occasion of the Pysanka Exhibit in Congress. A delegation of Ukrainian women's NGO leaders meets with Congresswoman Marcy Kaptur and Nadia McConnell of the U.S.-Ukraine Foundation. Photo by Adrian Karmazyn. A delegation of Ukrainian women who came to the U.S. to participate in a United Nations gender equality forum met with Rep. Marcy Kaptur (D-OH) on March 20 at her Capitol Hill office. The women, who are NGO activists and business entrepreneurs from the Odesa, Donetsk, Cherkasy and Kyiv oblasts of Ukraine, emphasized the importance of increasing women's participation in political decision-making and economic development at the regional and local level, with special emphasis on rural areas of the country. The timing of their visit was particularly fortuitous as Congresswoman Kaptur is embarking on a trip to Ukraine in her capacity as Honorary Chair of Seeds of Hope, a program aimed at empowering women farmers in Ukraine. Rep. Kaptur encouraged the delegation from Ukraine to become engaged in making the Seeds of Hope initiative, which will introduce simple new technologies and concepts for efficient and successful farming for women engaged in small-plot agriculture in Ukraine, a success. During the discussion, the Ukrainian women also raised the issues of the deadly threat of thousands of landmines that have been laid in agricultural lands that are now the "no-man's land" between Ukrainian government-controlled territories and the areas of Donbas held by Russian-led separatists. 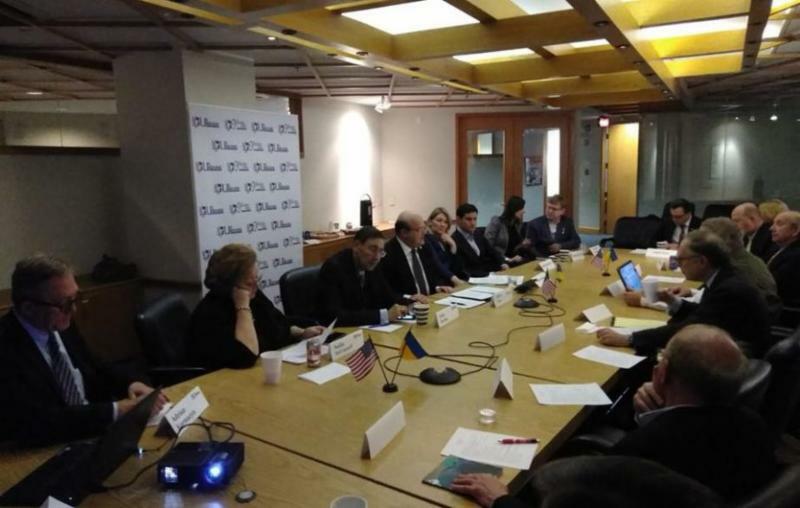 Earlier that day, the group spoke at the U.S.-Ukraine Foundation, where they talked about the challenges that internally displaced persons fleeing Russia's occupation of the Donbas and Crimea face in establishing new livelihoods in other parts of Ukraine. They also called for more foreign assistance to be targeted at training women's NGOs and citizen advisory councils at the regional, municipal and local level. The delegation came to the USA to participate in the 62nd session of the UN Commission on the Status of Women, held March 12-23, 2018, at the United Nations Headquarters in New York. The priority theme of the gathering was "Challenges and Opportunities in Achieving Gender Equality and the Empowerment of Rural Women and Girls." Svitlana Salamatova, Vice President of the International Institute of Cultural Affairs, was the coordinator of the Ukrainian delegation. The other members of the group included: Natalya Deliyeva and Olena Palashek of the Association of Women of Ukraine Dyia (Action) in Odesa; Maryna Gurianova - Head of the Community Media Hub in Cherkasy; Yuliya Gerzanich - Project Manager of the Association of Conflict Resolution and Social and Psychological Support "Word Aid" in Boyarka (Kyiv region), Inna Mikhno - Member of the Association of Women of Ukraine Dyia (Action) in Kyiv; and Hanna Aladieva and Svitlana Chepelieva of the Association "Women's Association Pani (Ladies) in Kramatorsk, Donetsk oblast. It is worthy to note that Ms. Gerzanich is an IDP from Crimea and Ms. Mikhno is an IDP from Donetsk. In an interview with the Voice of America's Ukrainian Service, Ms. Chepelieva discussed the delegation's efforts to promote women's rights and described some of the particular challenges that Ukrainian women face in achieving gender equality in society. The EBRD and the EU are extending their support to small and medium-sized enterprises (SMEs) in Georgia, Moldova and Ukraine to a total of almost €1.1 billion in credit lines and trade finance and €58.3 million in EU grants. Technovator, headquartered in Kepno, Poland, with its R&D operation in Kyiv, Ukraine, is a Ukrainian-Polish effort to bring to the global market a new type of wireless charging technology for smart devices and other electronic products. "In early 2014, myself, Ivan Chuba, Ruslana Dovzhyk and Igor Lykhovyi decided to establish a company that would be focused on innovative products" said Leszek Sawicki, now CEO of the startup. At the time, Leszek and his colleagues held several meetings in Kyiv. On his way to one of them, his smartphone died leaving him no easy way to contact his partners. And so the entrepreneurs decided to come up with a system for wireless charging of smartphones that did not require a plug-in connection, or placing the device on an inductive coupling. The first prototype of the wireless charging system was developed in the Fall of 2015. Their product Technovator XE won first place in the Vernadsky Challenge engineering startup competition held in April 2016 in Dnipro, Ukraine. 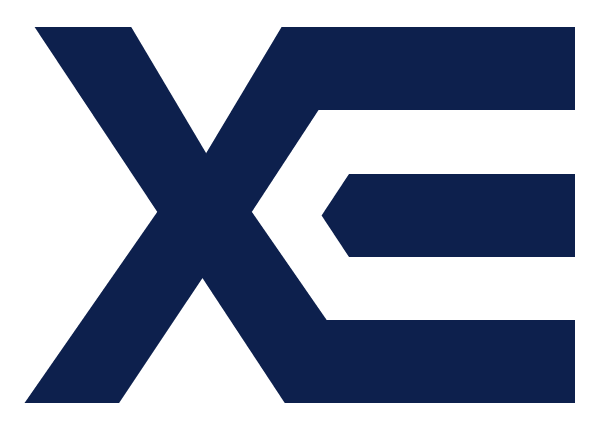 In January 2017, the entrepreneurs took their XE prototype to the Consumer Electronics Show (CES) in Las Vegas and received useful feedback to continue its development. The use of biogas for energy is starting to grow in Ukraine, one of the world's largest food producers. Over the last three years, farming companies have built biogas plants with capacities totaling 25 MW. MHP, Ukraine's largest chicken producer, is building a 10 MW plant in Vinnytsia. Financed by a €25 million EBRD loan, the plant will be fueled by chicken manure. ... for use by police, border guards and emergency services. Ukraine's Interior Ministry says that the first helicopters will arrive this year. The order is for a mixture of Н145, Н125 and Н225 models. The value was not disclosed. Until now, the National Guard of Ukraine has largely flown Russian-made Mil Mi-8 helicopters. MadeinUkaineTechStartupEdition is a monthly podcast series produced and hosted by Mike Buryk, a member of the U.S.-Ukraine Foundation's Board of Advisors, a long-time Foundation supporter and business development advisor. 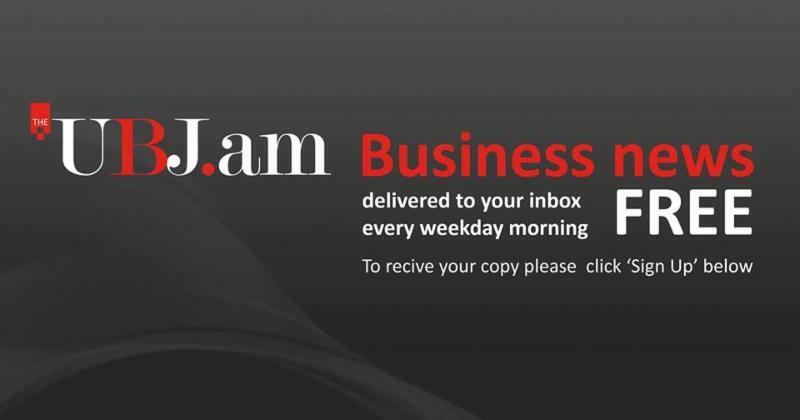 Start listening today ... go to https://soundcloud.com/ukrainetech/ . For additional information, please contact Michael Buryk at: mikeb@mburykassociates.com . 40 Under 40 Awards- $25,000 in Prizes To Go To Top Awardees! As part of its Biotechnology Initiative, the U.S.-Ukraine Foundation (USUF) is currently accepting nominations for its 40 Under 40 Emerging Leaders in Biotech Awards Program. The Foundation seeks to recognize 40 innovators, researchers and entrepreneurs under the age of 40 in biotechnology, a cutting-edge field that holds much promise for Ukraine's economic future. Through its Biotechnology Initiative, USUF aims to advance the state of biotech in Ukraine by fostering educational, research and business development in the sector and raising international awareness about biotech opportunities in Ukraine. Nominations for the U.S. - Ukraine Foundation's 40 Under 40 Emerging Leaders in Biotech Awards can be submitted online by clicking the button below. Candidates for the awards may nominate themselves or be nominated by others. All nominations must be made via our online web portal (use the button below) and all submissions and supporting reference letters must be submitted via this portal no later than March 31, 2018. The Foundation's Biotech Advisory Board will review the applications and select the top 40 nominees on a competitive basis for their innovations or other contributions to the biotechnology field in Ukraine. USUF seeks to recognize the biotech achievements of the nominees based on such criteria as leadership in the field, entrepreneurial accomplishments, potential for commercialization of their research, current or future impact of their research or innovation, and/or overall benefit of their activity or innovation to Ukrainian society. Honorees will be recognized at the Foundation's 40 Under 40 award ceremony and the top eight awardees within the group, as determined by USUF's Biotech Advisory Board, will receive a special prize: four of them will receive a cash award of $2500.00 and another four will have the opportunity to participate in a biotech forum in the United States, with travel and lodging expenses covered by The U.S. - Ukraine Foundation. Thus, a total of $25,000 in cash and prizes will be awarded by USUF in this award competition. All "self-nominating" applicants in this category must provide two (2) reference letters which must be submitted by the reference provider directly to the U.S. - Ukraine Foundation electronically via our web portal no later than March 31, 2018. Persons nominating others for the award (i.e., "the proposer") must provide a letter of reference as well as contact information for a second reference along with the electronic application form. The second reference letter must be submitted by the reference provider directly to the U.S. - Ukraine Foundation electronically via our web portal no later than March 31, 2018. On March 18, over 76% of Russian votes confirmed that President Vladimir Putin will lead the country until 2024, in an election that "was rigged long before the first vote was cast," according to Vladimir Kara-Murza, Chairman of the Boris Nemtsov Foundation for Freedom, who spoke at the Atlantic Council's Eurasia Center the next day. Putin approaches his fourth presidential term while conflict continues in eastern Ukraine, Russian authority is deeply imposed on occupied Crimea, and the West responds to Russian acts of aggression on their territory, such as interference in America's elections in 2016 and the poisoning of Sergei Skripal and his daughter by nerve agent in the United Kingdom this month. Ukrainians, unlike Russians, "do not wait for change to come from the top," stated Dr. Lilia Shevtsova, Associate Fellow of Chatham House, in the same discussion of the overwhelming pro-Putin result. In the preceding week, several distinguished panels in Washington discussed what changes might be coming, and not, in Moscow's relations with Ukraine. One recurring question was the threat of military escalation or the prospects for peace in the Donbas. American soldiers are fighting pro-Russian separatists today in volunteer units, according to Commander Mamuka Mamulashvili, who the U.S.-Ukraine Foundation welcomed for a roundtable discussion on March 12. He leads the Georgian National Legion, holds a doctorate in international relations, and warned that Russian forces are amassing again close to the Ukrainian border. 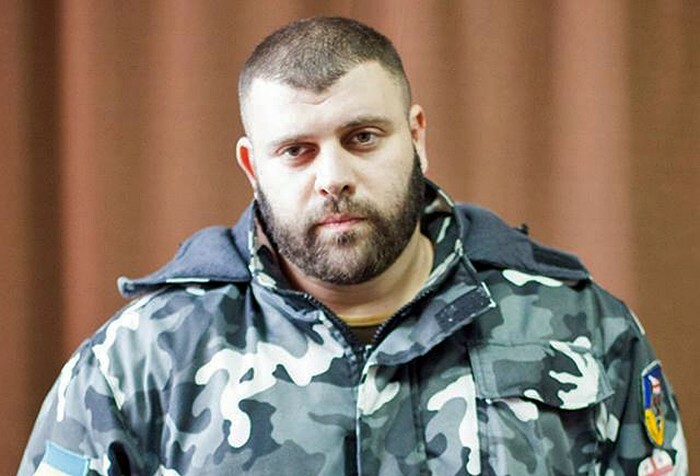 Mr. Mamulashvili said he was prepared to defend against a new offensive this spring, possibly connected to Putin's election, given his experience in the Russo-Georgian War that broke out shortly after Russia's 2008 presidential election. The same day, Vadym Glamazdin, an envoy of Ukraine's Naftogaz, spoke at a discussion of Nord Steam 2 at the Atlantic Council's Eurasia Center. He too mentioned the buildup of Russian military power in the country's Southern Military District and warned that "the only effective mechanism that stops them from using this force" against Ukraine is the current pipeline. If Nord Stream 2 is implemented, Russia would have no fear of attacking, Mr. Glamazdin said. Dr. Anders Åslund, an economist with the Friends of Ukraine Network's Economy and Energy Task Force, said the main role of Gazprom, Russia's state natural gas company, is to "enrich Putin's inner circle," a goal that could be well served by Nord Stream 2 going forward. Other experts were more neutral on changes in Russian behavior. At the Atlantic Council's March 19 panel, Ambassador Alexander Vershbow, former NATO Deputy Secretary General and a member of the Friends of Ukraine Network's National Security Task Force, said that neither escalation nor de-escalation seem especially likely in the Donbas conflict. Unlike when the Ukrainian public rallied against Russia's illegal annexation of Crimea in 2014, today's political landscape is more divided. When Ukraine will vote in spring 2019, a year into Putin's new term, Russia's leadership will likely "count on Ukraine to fight itself." Amb. Vershbow's point echoed some of the views of Mikhail Zygar, an independent Russian journalist, author, and former editor-in-chief of TV Rain. Mr. Zygar said at the Wilson Center's Kennan Institute event on March 13 that the war in eastern Ukraine has been forgotten by much of the western and Russian publics. "No one is mentioning Donbas, and that is the real problem," commented Vershbow. He also said that Moscow's assertive rhetoric could be interpreted as a condition to begin or advance negotiations, such as on the United Nations peacekeeping mission being discussed by U.S Special Representative Kurt Volker and Russian presidential adviser Vladislav Surkov. Mr. Zygar recalled Putin's first presidential term, in which he ordered the closing of Russian naval bases in Vietnam and Cuba. When this yielded no desired results, Putin solidified his distaste at concessions. This applies to Crimea. "I see no sign so far that anything has changed in terms of Crimea since 2014," Mr. Zygar said. Despite last year's controversies around corrupt Russian politicians, there appears to be a consensus in Russia that "Crimea is ours," and many believe that the Crimean population is satisfied with the annexation. "For most Russians, the war is over. For Ukraine, it's still on," added Zygar. This last point cannot be overstated. On the evening of March 14, supporters of Ukraine gathered at the U.S. Capitol for a film screening hosted by the Embassy of Ukraine. They watched Akhtem Seitablayev's 2017 film, Cyborgs: Heroes Never Die, a candid, vivid portrayal of Ukrainian volunteers defending Donetsk Airport from separatists and their Russian sponsors. The audience included Hero of Ukraine Volodymyr Zhemchugov, Mr. Seitablayev, and Iryna Gerashchenko, First Deputy Chairwoman of the Ukrainian Parliament. They all attested that the Donbas was not in a state of civil war, but under active invasion by a foreign power. Mr. Zhemchugov, who lost his eye in combat and survived torture as a prisoner of war, praised the United States as Ukraine's most reliable ally. There was a consensus among Ukraine's visitors to the U.S.-Ukraine Foundation in the week before Putin's predictable referendum on power: Ukraine has revived and rearmed its military since 2014, is growingly faithful in its alliance with America, and is prepared to face whatever the Kremlin decides to do. The strong support that Ukraine has received in recent years, especially from the U.S. Congress, did not occur in a vacuum. It is the result of much work by individuals and institutions over the course of many years, indeed, over the last century. An important component of laying the groundwork was the commemoration of important anniversaries, whether it be the annual Independence Day (both 1918, and for the last 26 years, 1991) or one-offs such as the 1988 Millennium of Christianity of Kyivan Rus'. Orest Deychakiwsky is a former Policy Advisor at the U.S. Helsinki Commission and currently a member of the U.S.-Ukraine Foundation's Board of Directors. The U.S.-Ukraine Foundation's new website has been created by Steven May, Jr. and his talented team associated with Ask the Egghead. Steven May Jr., aka lead egghead at Ask the Egghead, has over 25 years of career experience that spans multiple business models and sectors. 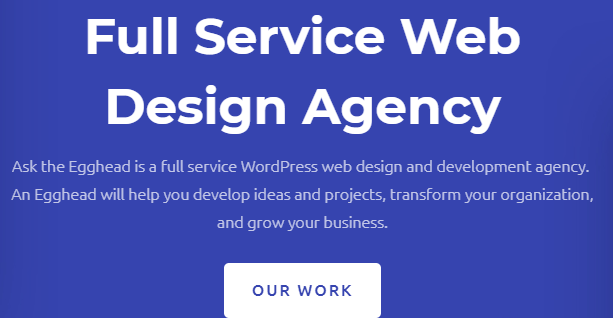 If you need website support, Ask the Egghead! SUPPORT UKRAINE ... SUPPORT USUF !